Polter’s Berry Farm grows about 180 acres of wholesale pumpkins each year. 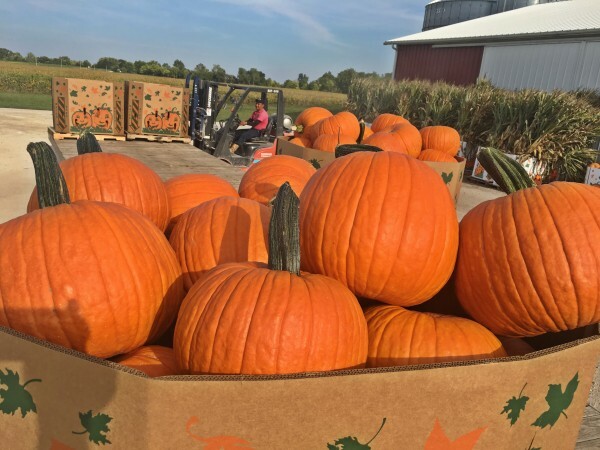 100% of our pumpkins are sold wholesale to customers all over the eastern United States. We specialize in serving farm markets, fall festivals, agri-tainment farms, and garden centers. We carry a full line of fall items in addition to pumpkins that can complete your display. We plant our pumpkins into killed rye which was planted the previous fall. The rye is rolled down immediately ahead of the planter giving the pumpkins a carpet of rye to lie on instead of dirt. 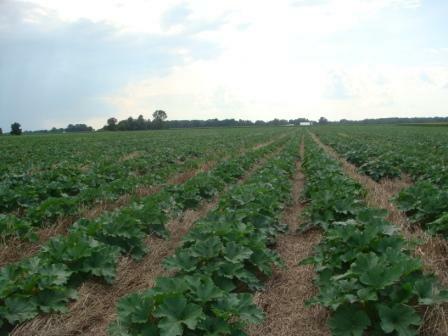 This no-till system allows us to produce pumpkins as clean as can be. We also follow an intensive spray program to assure our customers of a product that is disease free. We plant several different varieties including Gladiator, Apollo, Solid Gold, Cronus, and Field Trip. 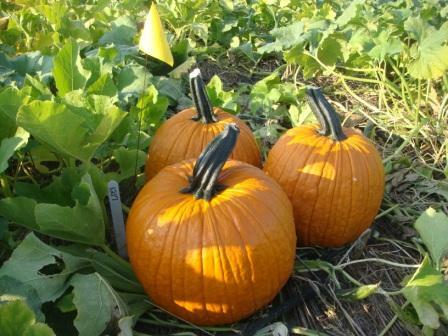 Our pumpkins range in size from 3-6 lbs for pie pumpkins to 15-45 lbs for Jack O’ lanterns. We also offer a white pumpkin, Cotton Candy, various fall items including gourds, mini pumpkins, large and mini indian corn, corn stalks, hard squash and giant pumpkins (prizewinners). We pack our pumpkins in 36″ tall high graphic cardboard bins. The bottom bins are level full with the top bin crowned as tall as possible. A typical bin contains 30 -40 pumpkins each weighing 20-30 lbs. A bin of pie pumpkins contains around 200 pumpkins each weighing 4-5 lbs. 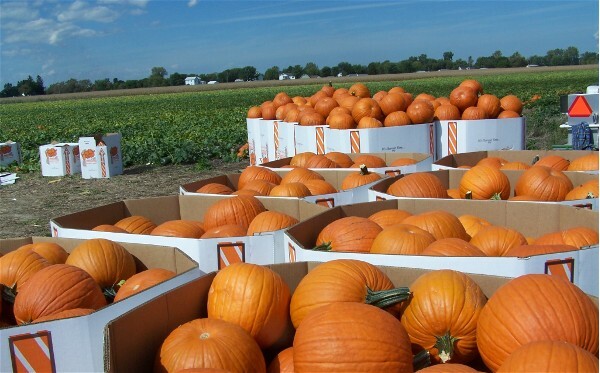 We have shipped pumpkins all over the eastern United States. Your order must be at least one 53′ trailer load for out of state delivery. Smaller loads can be arranged for instate delivery. A trailer load usually contains 50-56 bins or approximately 2000 average sized pumpkins. Most loads usually run about $4500 to $5500 plus freight which averages $2.50/mile. For example, Chicago, Pittsburgh= $600-700, Virginia, East PA, New Jersey = $1300-$1600, Florida-$2200-2500. Our shipping season starts September 7 and winds up just before Halloween.